Australian pilgrims at the World Youth Day 2019 Australian Gathering in Panama City. Image: Diocese of Parramatta. World Youth Day 2019 begins for Diocese of Parramatta pilgrims with Aussie Gathering and Opening Mass. 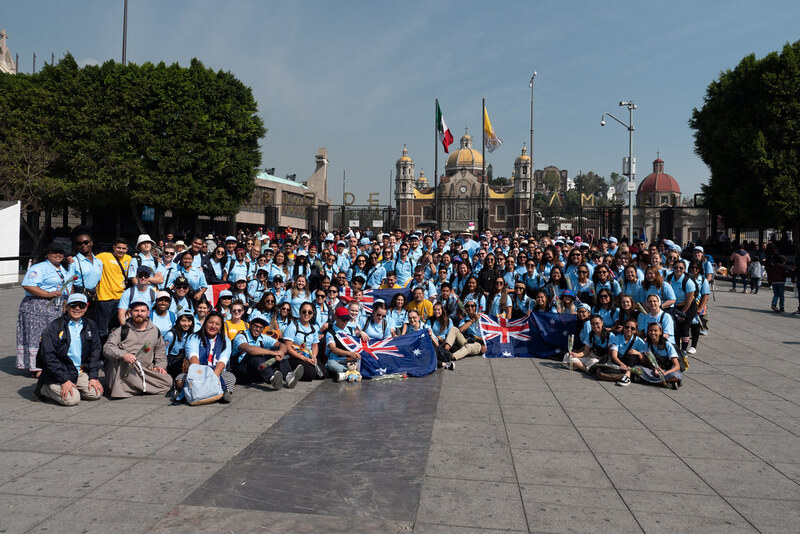 Seven hundred Australian pilgrims have descended on a church car park in Panama City for the World Youth Day 2019 Australian Gathering. The Aussie gathering outside the San Francisco de la Caleta Church in Panama City featured performances from Aussie musicians Simon Hyland, Fr Rob Galea and special guest US Catholic rapper Joe Melendrez. Most Rev Christopher Prowse, Archbishop of Canberra and Goulburn, encouraged pilgrims to not concern themselves whilst on this pilgrimage with the “horizontal” – the small things in life, “have I had my coffee? Have I got wifi?” but rather concentrate on the “vertical” – towards God. He went on to say that that all Catholics are called to be missionaries by virtue of their baptism. James Camden, Director of Catholic Youth Parramatta, gave a personal testimony about his experience from his first World Youth Day in Sydney in 2008. He spoke about when he was plagued with a large argument during the pilgrim walk to the Final Mass at Randwick Racecourse. He described how that experience, whilst at the time was upsetting, led to a much closer relationship with his partner and ultimately finding his vocation. Diocese of Parramatta pilgrims during the World Youth Day 2019 Opening Mass in Panama City. Image: Diocese of Parramatta. Pilgrims are seen during the World Youth Day 2019 Opening Mass in Panama City. Image: Len Lara/Diocese of Parramatta. Following the gathering, pilgrims made the long walk down to the Cinta Costera for opening of World Youth Day 2019 with the Opening Mass celebrated by Most Rev Jose Domingo Ulloa Mendieta OSA, Archbishop of Panama. The Mass had a unique local flavour with a combined choir and orchestra from countries in central America delighting the locals and visitors alike. A procession during the World Youth Day 2019 Opening Mass in Panama City. Image: Diocese of Parramatta. The combined central American choir and orchestra during the World Youth Day 2019 Opening Mass in Panama City. Image: Diocese of Parramatta. Catechesis for the Diocese of Parramatta pilgrims begins on Wednesday morning and in the afternoon, Pope Francis will arrive in Panama for an Official Welcome. International pilgrims are seen following the World Youth Day 2019 Opening Mass in Panama City. Image: Diocese of Parramatta.